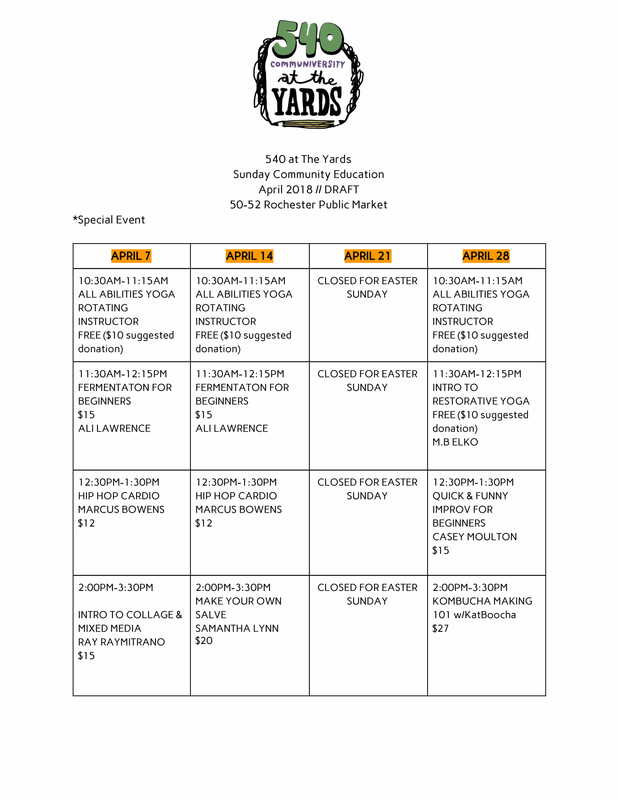 All classes held at 540WMain HQ will require registration/RSVP online with payment at the door. No one will be required to pay for classes in advance online. 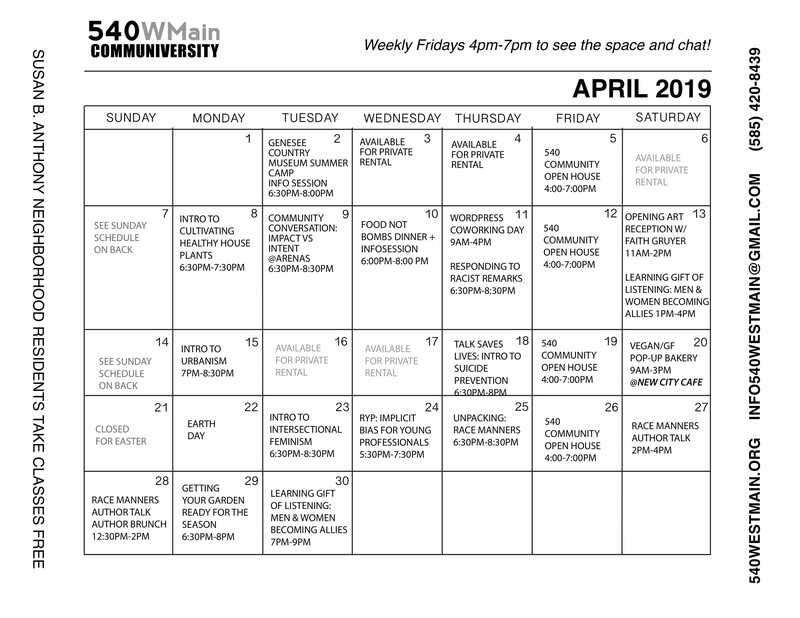 This change happened primarily to allow for greater access and flexibility and to make taking classes at 540WMain accessible for all neighbors wishing to take classes at our space. We understand that this change in policy was a considerably risky move for a small grassroots non-profit, but after much consultation and communication with the community found it worth the risk. With this new model we simply asked that if you are unable to attend a class for which you have RSVP’d that you email us (info540westmain@gmail.com) prior to the course. While some community members have been compliant we have found a growing number of community members registering online and then no showing for classes; despite the pre-class reminder email that we send out prior to every class reminding attendees of the policy. Instructors go through considerable time to prep and having an accurate headcount is vital to ensure the success of each class. If we know you are not attending we can make your space available for other guests. We are a small non-profit and setting up space and resources for no shows is taxing on our limited time and human resources. It is our hope that everyone reading this message takes this call in seriously, honor our policy, respect RSVP etiquette so that we can continue to make classes affordable and accessible to all. Effective Immediately all classes will require registration/RSVP online with payment at the door. No one will be required to pay for classes in advance online. As I have shared in previous communications, a lot of behind the scenes planning, coordinating and preparation goes in each and every class that takes place at 540WMain. I’ve found that our current structure of requiring some classes be paid for online and others be pay at the door has proved to be confusing for our hosts and interns as well as the community. This along with the fact that not everyone has the ability or desire to pay with a credit card online has made this change necessary. Your interaction with registration will largely remain the same. If you have currently paid for a future class online there is nothing you need to do but show up for your class as usual. Eventbee will continue (for now) to be our event registration platform. All classes will continue to have a RSVP link that will allow you to RSVP online only. Once you RSVP for the class you simply show up on the planned day and make your payment in cash or credit card at the door. Exact change is always preferred. We make your space available for another community member. Following these guidelines will allow our course instructors to allocate resources as accurately as possible and prepare properly for all courses. As we continue our year of “sustainability” you should continue to expect refinements and improvements in the way we interact with you as community partners. I cannot wait to share more exciting developments and sustainable changes with you as the year progresses.